When Dr. Gabriel McCormick crowns one of our patients, the coronation is a celebration of a stronger smile. The necessity of a dental crown is usually readily apparent. Based on how much tooth is available to hold in a filling, sometimes a crown is necessary to add more support and to keep the tooth from falling apart or breaking. Crowns are also needed as a sturdy support for dental bridges. Bozeman Dentistry – Gabriel McCormick, DMD, located at 1482 North 15th Ave., Ste. 2 in Bozeman, Montana 59715, opened their doors in 2011 and has been serving patients throughout Montana with outstanding efficiency, expertise and personal attention since. If you live in Bozeman, Livingston, Belgrade, or Big Sky, you could be our next royal to smile and wave for the paparazzi. Consult with Dr. McCormick to find out if you are a candidate for state-of-the art restorative procedures meant to increase the life of your precious permanent teeth such as a fabulous crown. Keep in mind that crowns come in a variety of strong, reliable materials. Matching the natural color of your teeth increases the beauty of your smile. Gold crowns are incredibly strong and have the “bling” factor. But there are certainly options. In addition to restorative services, please ask us about cleanings, cosmetic services, teeth whitening, braces, veneers, and other smile makeover possibilities. We are equipped to offer teeth whitening, restorative dentistry, porcelain veneers, Invisalign clear braces and a long list of other procedures. The cost of cosmetic dentistry, the expense of cosmetic dentistry, and the affordability of cosmetic dentistry can all be discussed during your no-pressure, easy initial consultation. Schedule your visit today with our trustworthy staff at 406-586-7661. 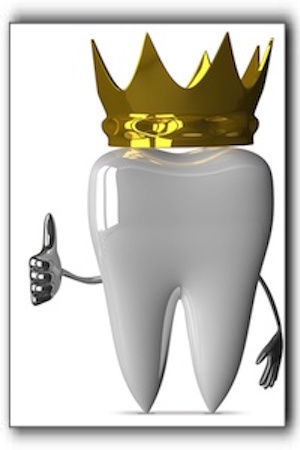 A crown can return your tooth to all its former glory as a smiling, glowing, chewing machine. Become royalty. What’s New At Your Bozeman Dentist Office?